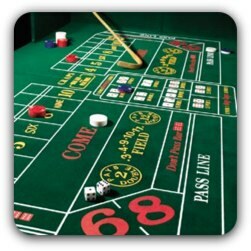 Craps is a fast-paced and exciting game that relies on quick decisions and a lot of luck. 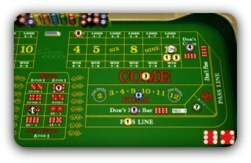 With a speed unmatched by any other casino game, Craps requires guts and tenacity to succeed in but nonetheless there are some basic rules which need to be understood by any player. Although becoming well-versed in the game of Craps requires a lot of skills which can only be acquired through experience every player must start somewhere by learning how the play itself functions. The game is typically set up through two tables on either side of yet another table which takes ‘proposition bets’ which are gambles on only one roll. Each of the two tables has a ‘boxman’ who handles money and the ‘stickman’ who passes dice to the ‘shooter’ or player who is rolling for a certain turn. The tables are set up so players can either bet for or against the shooter (these bets are set up on the ‘Pass’ or ‘Don’t Pass’ areas respectively). The ‘Come’ and ‘Don’t Come’ areas function in a similar fashion although they play out at different times of the game. The ‘Field’ area is set-up for one-roll bets as well which essentially function outside of the common gameplay. If this sounds confusing don’t worry too much as the game is actually much simpler than it may initially appear. Essentially, craps gamblers are betting on the outcome of the thrown dice and odds are laid down for different areas set-up for different results. For example, a player may place their chips on a single number or field a bet on one dice roll coming up with a variety of different numbers. Play boils down to either going for broke by placing a lot of money on one number or spreading the chips out amongst a few different values. All of this takes place with or against the shooter in most cases although betting methods can vary wildly within the game. Just the same, knowing the basic rules stated above will help novice Craps gamblers to get started in playing the game and seeing the different ways the structure can function for themselves. One of the most challenging factors for new Craps players has to be the steep learning curve represented in the game’s lingo. Although there is probably more to discover than what can be covered here there are a few basic terms which gamblers will need to have understood in order to keep their heads above water. For starters, Craps itself refers to a two or three, snake eyes for two ones, boxcars for two sixes and there are a plethora of terms for an eleven roll (including yo, yo-leven, or C and E Craps). Some dealers won’t be as aggressive with Craps slang as others but players should probably at least have an idea of the terminology before an alien language starts being shouted out from a new table. Statistically gamblers have the best odds when betting on a seven considering laws of probability regarding the dice shots. Past the basic rules and layout of the game players will have to become well versed in the large variety of different bets available to them. Although much of Craps comes down to sheer luck and smart bankroll management there is a decent amount of strategy that can be learned by dedicated players seeking ways to further increase their wins.